The Book was printed in NY in 1915 2 years prior to his passing, nothing is mentioned about his position in RIETS, wonder where that information comes from. Rather, the last writing was written in honor of the 65th Anniversary of his Kosher Whisky Distillery which was under the supervision of the two prominent Margolies Rabbis RMZ and RGZ. It is written on the tombstone. It also mentions that he gave a regular shiur at MTJ as well. So we are not seeing the entire writing on the tumbstone, can you post the other side of it? Rabbi Shapiro was my great-great grandfather. I’m in the process of doing genealogical research and would love to know more about him. Someone mentioned that in his book from 1915 it said he had three unmarried children and 4 others. Did he mention their names? I’m apparently missing a child. 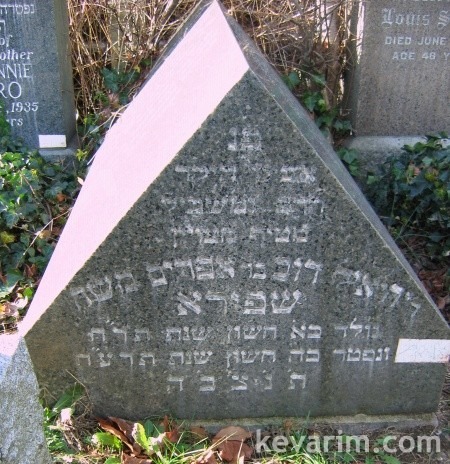 I have Louis (not sure what his Hebrew name would have been but he was married before 1915), Yaakov, Simcha, Yechezkel, Meyer, and Tobias. Also, if someone could provide me with a link to the other side of the gravestone, I would appreciate it! I knew Tom (Tobias), who worked for my grandfather and my father in the garment business. Tom married Estelle Savada, my 1C1R. Simcha (Simon) is the son-in-law (not a son) of Yechiel who married Annie (pictures are on my Ancestry tree). Yechezkel (Oscar) BLUM is also not a child of Yechiel, but a son-in-law. The other children Aron Leib is Louis and Yaakov ois Jacob (Jack).